Our personal energy is immense and can act in heroic ways, however, it is often locked up in our subconscious self. The Mahabharata Immersion is an invitation to experiment with oneself, delve unto the depths of the invisible, the in-articulated and the disowned parts of ones self by donning the traditional masks from the Koothu tradition. 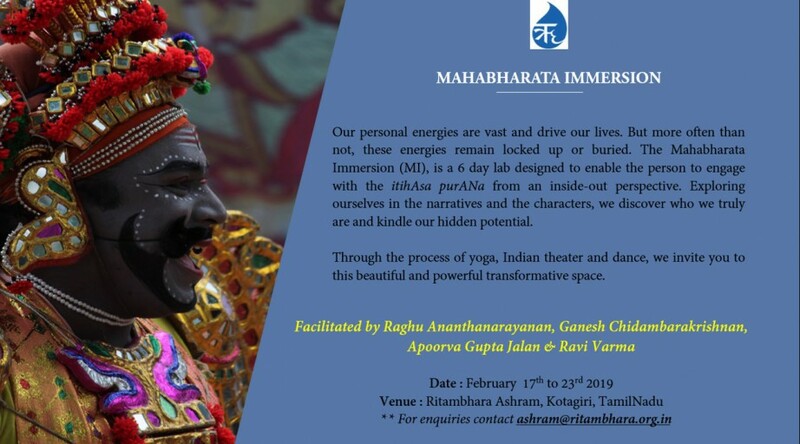 The Mahabharata Immersion Workshop is intended to enable the participant to engage with inner work and the Purana fron an “inside -out” location. One wears the masks of the Heroes and in playing out the archetypal drama that occurs at various turning points, views oneself in the mirror of the emerging “here and now re-play” of the eternal motifs of life and relationships with significant others. An individual is simultaneously a member of multiple systems – organization, society, family, and others. Each of these systems is a complex network of interdependent roles and processes with distinct values and norms. The diverse pulls and pressures of the systems and lack of integration and synergy in oneself result in diffused inner energies and consequently affects the expressions. The learning theatre is designed to focus on inner energies and enable coherent expressions. An exploration into one’s inner process is enabled by bringing alive ones inner drama and the personas that play out these psychodramas. The participants will also work with actors from the Koothu tradition. Having explored the dynamics of heroism within, the participants will be introduced to the nuances of the myth. By working with the traditional masks, music, rhythm, and dance, the rasa of each hero is evoked and explored. For example, through an exploration of ‘Draupadi Vastraaharanam’ (the disrobing of Draupadi), a powerful field is created where the helpless rage of the victimized is contrasted with the blind greed of the oppressor and the lack of conviction in the legitimate protector. The individual who explores this archetypal drama with authenticity enters the universal motifs of human suffering. Such engagement with one’s dukka is deeply insightful and healing. The stage is thus set for an honest introspection of one’s inner patterns of feeling and thought as well as one’s outer patterns of action. The workshop is open to all professionals and people from all walks of life who wish to delve inwardly and regenerate oneself. This program enables one to discover and develop creative processes of their own unfolding, thereby facilitating self-discovery in others. No prior theatre experience is required for this adventure, although prior experience of inne work is always of value. Participants will be required to read the Mahabharata, and discussions will be initiated prior to the start of the laboratory to facilitate the exploration. Our ancient texts recommend that all leaders and professionals be yogis. Yoga, when practised in a holistic fashion, ensures that a person becomes capable of being the best they can be. Leaders and professionals need to strive continuously to perform at their peak capabilities. This means that one has to make a continuous investment in one’s competencies, one’s inner well being, and one’s health. However, the meaning of Yoga is limited to Aasana and Prananaayama in most people’s minds. Our myths were written to bring out the meaning of Yoga through the stories that illustrate how different types of minds perceive a situation and how they respond. The Mahabharata portrays the five Pandava heroes as the central archetypes of the human psyche, the Kaurvas as the anti-hero/shadow archetypes, and Krishna as the meditative mind. Through the drama played out by the Paandavas and Kauravas, the text discussed Yoga in the context of familial strife. The Mahabharata is thus a dialogue on the Yoga of leadership, and dharmic conduct. It is a complete text of Yoga, capturing its philosophical profundity as well as evoking the person by using the narrative of different archetypal heroes who are placed in difficult and trying situations as they delve into themselves and overcome obstacles. Indic Academy has decided to extend a scholarship to Kyla Churchman for attending this workshop. Churchman has been attending courses at Krishnamacharya Yoga Mandiram in Chennai for the last four years. She has a background in theatre and is particularly keen to attend the MI Lab. More details are available in this brochure.